Kansas City’s gates fling wide to release Mac Lethal. He may like to pound the beer but don’t let the love for brew fool you. His rhymes will sober you right up! When a rapper’s rhymes resonate and go beyond just catchy, the rapper probably has the ability to be multi-dimensional and to express more than just one emotion. And when this happens in popular culture, we usually accuse a rapper of being hypocritical or two-faced. And sometimes that is true. But when an emcee with legitimate talent does show us several sides of who he is, what usually happens is the possibility of transcendent lyrics flowing out of his mouth and into your ears. The debut album 11:11 from Kansas City rapper David Mac Cleary Sheldon (a.k.a. 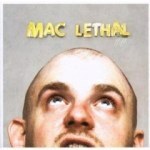 Mac Lethal) is not necessarily transcendent but it is a debut album that sets the bar high for the follow up. And the main reason is because of how he balances all sides of his personality from song to song, lyric to lyric. There’s the silly side with “Pound That Beer”, a self-proclaimed “pub anthem” that also has a subversive message of mockery for the mindless slamming of countless brews at your local pub, which becomes apparent in the context of the rest of the album and not so much as a single as it was the first released from the album. Then there’s the thoughtful and almost poetic sage-like side that appears, especially with the mature and introspective “I Know It All”, which finds Mac Lethal lucidly rhyming about people he knows and how he hopes they can overcome themselves and their small town psychological vices, and then eventually turning the spotlight on himself. The lyrical side of hip hop can be an extreme expression of self when an emcee truly opens up, so it’s no big stretch to accept the mature with the less mature if one enhances the other or, better yet, makes the album into a sort of battle against the two, which happens several times on 11:11. Of course, with artists like Slug from Atmosphere, among others, you almost expect the indie hip hop label Rhymesayers to produce an artist of Mac Lethal's kind: an accomplished battle rapper and gifted and silver-tongued freestyler who can do more than write a catchy hook. Mac Lethal won the 2002 Scribble Jam and has been earning his road chops by opening up for Atmosphere and Sage Francis during which he’s certainly sharpened his skills to spin lyrics that create a sort of controversial offspring hybrid of Eminem’s Slim Shady character, Hunter S. Thompson, and Charles Bukowski with flashes of other old school emcees surfacing depending on what verse he’s rhyming. He raps a poetic free-verse style that changes cadence gears to keep you on your toes, rhyming in a way that makes you grimace at the punch line and then thoughtfully rub your chin as the meaning sets in. On lead track “Backward” he describes his hometown, including a sobering line about holding his dying mother in his hands, which he says forced him to cancel an impending tour. Putting this in the first track leads you to believe at the onset that he intends to go to a level of honesty and express a concern for the world around him -- albeit sarcastic one -- and often walks a thin line between glorifying his substance abuse struggles and making fun of or explaining them. But at the end of 11:11, after all the sardonic goofiness has been gulped down, you end up walking away with a picturesque and intricate psychological trip through an emotionally detached Midwestern existence that he’s used hip hop to cope with. It’s difficult to label tracks like “Rotten Apple Pie,” “Crazy (Perfectly Content)”, and “Jihad!” as flippant and juvenile because, even though the silly melody creates that type of ridiculous atmosphere, Mac Lethal is clearly appealing to childish humor in order to deliver heavy social commentary on relationships, drugs, and religion. And on “I Know It All”, “Calm Down Baby”, and “Lithium Lips”, he ditches the court jester costume somewhat and offers up three strong and sober straightforward tracks, showing one of the reasons why the album is such an engrossing and balanced dark carnival whirlwind. The other reason is the surreal production and mixed orchestrations of jazz, rock, and soul samples spliced in between classic boom-bap style beats that almost go unnoticed underneath Mac Lethal’s tumultuous rhymes. The production team, headed by Michael “Seven” Summers, S. Daley, S. Sayers, and DJ SKU, creates a sonic journey through native Kansas City that mirrors Mac Lethal’s addictive and unpredictable lyrical content. Under the umbrella of hip hop’s standard one’s and two’s is a slithery subterranean stew of humming organs, emotive strings, muffled crashing cymbals offset with the popping snare to slap that exclamation point on the end of Mac Lethal’s sarcastic shotgun spray rhyming as he crosshairs religious fanatics, weak-minded and jealous relationship refugees, and commercial rap artists who “make threats from recording studios”. Mac Lethal certainly seems to have the chops to make more albums like 11:11 and in a year where hip hop only seemed to get better with each week, 11:11 ranks as one of 2007's best indie hip hop debuts.